Are you a fan of the Blue Bomber, but sick of always having those pesky and, oftentimes, difficult platforming sections? If, for some odd reason, you happened to say yes, then this duo of titles should be perfect for you! Welcome to Mega Man: The Power Battle and Mega Man 2: The Power Fighters, two arcade games released in 1995 and 1996, respectively. That’s right, today we are delving into a review of two arcade cabinets! Don’t worry too much if you can’t buckle down and spend hundreds of dollars on an arcade cabinet of your own (I certainly can’t) because, luckily, these games were also released on the Mega Man Anniversary Collection as unlockables for completing Mega Man 3 and Mega Man 7, respectively. Above: Something I will never be able to afford. The two games are nearly identical in presentation and gameplay, which is why I’ve lumped them together into one review. 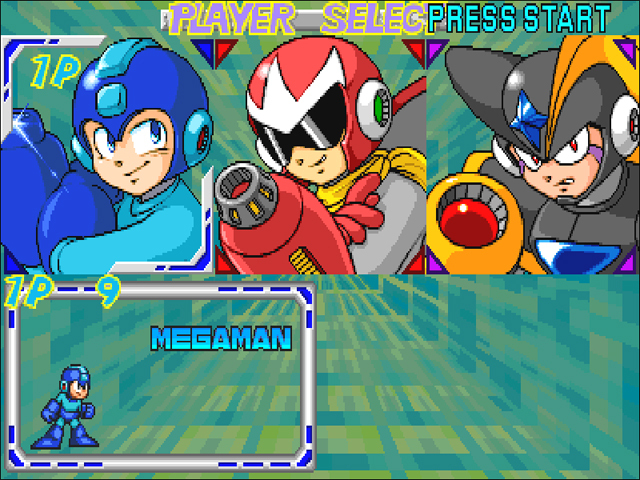 Each game is rather straightforward, offering you three groups of robot masters to fight through depending on which set you choose. 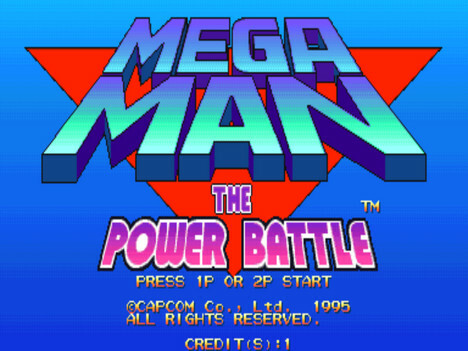 From there, the game essentially becomes a boss rush where you fight through six robot masters before facing off against a mini boss from the series, and then finally confront Dr. Wily at the end. There is close to no story involved in either title, though the character endings from the second game contain a few references that series’ veterans will find fun. If you’ve played any other Mega Man title, the controls should feel comfortable to you, unless, of course, the transition to an arcade joy stick and buttons from a controller throws you off like it did me at first. Everything is smooth and responsive as you play, which is a requirement in any fast-paced fighting game title, and these two titles do not disappoint in that regard. For the first time, you can take on robot masters with a friend! Though the games offer you multiple characters from whom to choose, they all play almost the same with the exception of their dash move, which has them moving at different heights on the screen. 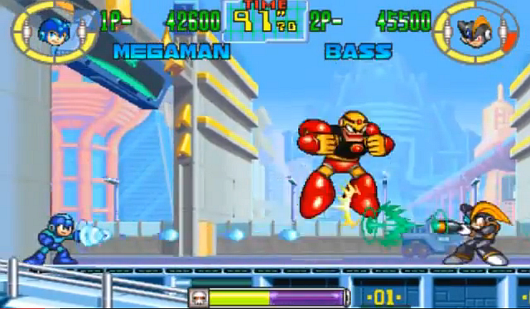 This ends up giving Mega Man a slight advantage because of his low slide. In the second title, the characters have slightly different stats from one another, and each has a unique special move, but, overall, it shouldn’t affect the way you play. The level of challenge in these games varies a great deal since it’s an arcade title, allowing you to just put in another quarter should you die. Not to mention the fact that the game keeps the usual ‘rock, paper, scissors’ weapon mechanic, so, if you know the bosses’ weaknesses, each battle should be fairly easy. The most notable gameplay element in these titles, however, is the fact that it allows for cooperative play, so now you and a friend can team up to take on Dr. Wily and whatever Robot Masters he throws your way. You get to play as any of these characters but they don’t keep their unique move sets. Probably the coolest thing about the games presentation are the colorful and detailed recreations of many of the 8-bit robot masters we’ve come to know and love over the years. Seeing them in their enhanced glory along with new and addictive arrangements of old songs from the series was entertaining. 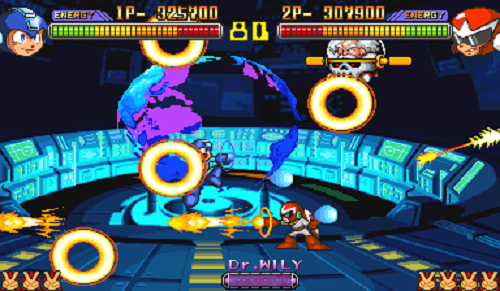 The sequel only has small aesthetic changes, but look: Mega Man and Proto Man vs. Dr. Wily! These games are rather short, clocking in at about 10 to 15 minutes per playthrough, but, given the entry cost of about 25 cents a game (up to a couple dollars depending on how many times you die), I’d say if you can find it in an arcade, you should give it a go! That or just unlock them on the Mega Man Anniversary Collection if you don’t care about authenticity. Former Contributor--A lover of video games and music. When he's not slogging through a game series he's playing his guitar (or enjoying the occasional tabletop RPG). Favorite series include Final Fantasy, Metal Gear and Megaman.